Two 116th Pennsylvania Volunteer Infantry Ladder Badges, c. late 19th century, a badge with two bars, marked "CO. G/116' PA.," and a shield marked with a 2nd Army corps badge and "VOL. 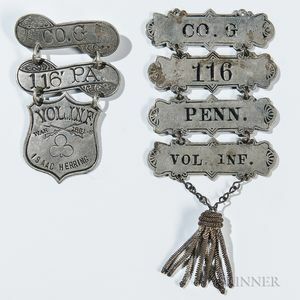 INF./WAR 1861-5/ISAAC HERRING," and a badge with four bars marked "CO. G/116/PENN./VOL. INF.," with a gold tassel hanging from a chain. First badge is in very good condition, second badge in good condition but the pin is missing on the back of the top bar.